Shape your sushi into a myriad of shapes with sushi presses and molds in wood, plastic and metal. 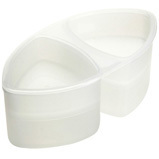 Two-piece plastic triangular mold. 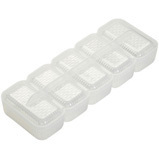 Add rice into mold, press down cap, remove rice with buttons on the bottom. Insides are textured to keep rice from sticking. 5.5 x 3 x 2 inches. Made in Japan. Enhance your sushi presentation. 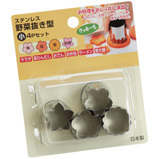 These vegetable 'cookie' cutters are used for cutting out star and flower motifs from vegetable slices. Set of 4 shapes each 1 inch in diameter. Made in Japan of stainless steel.